T. Quinctius Flamininus was one of the moneyers for the year 126 BC. He is not otherwise known. He is referred to as Flaminius in Crawford, but most modern sources use Flamininus. Gens Quinctia, sometimes written Quintia, was a patrician family at Rome. Throughout the history of the Republic, its members often held the highest offices of the state, and it produced some men of importance even during the imperial period. For the first forty years after the expulsion of the kings the Quinctii are not mentioned, and the first of the gens who obtained the consulship was Titus Quinctius Capitolinus Barbatus in 471 BC; but from that year their name constantly appears in the Fasti. The three great patrician families of the Quinctia gens bore the cognomina Capitolinus, Cincinnatus, and Flamininus. The surname Flamininus is probably derived from flamen, which also gave rise to the gens Flaminia. It may have signified an ancestor who was a flamen, or perhaps the servant of a flamen. 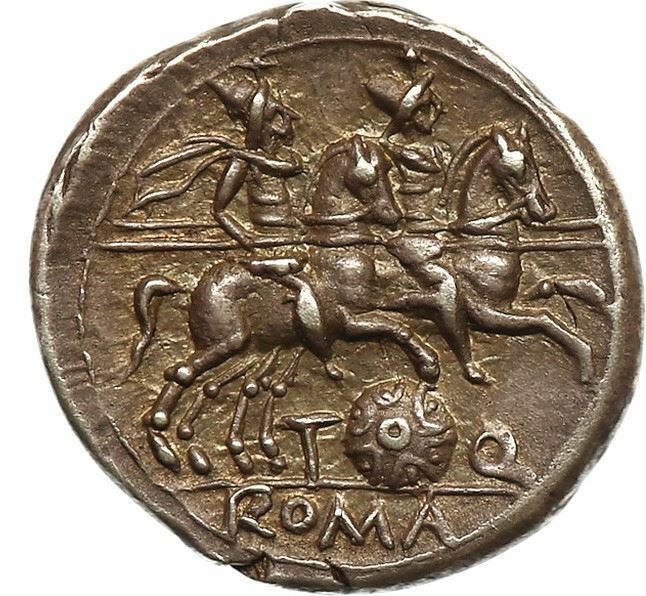 This family first appears in history during the Second Punic War, and it remained prominent over the next century.